A belated happy Holi from team Venmo! Just use the Venmo app for iPhone or Android to pay a friend at a location in Austin and share it with your friends to enter. The more payments you make, the higher your chances of winning. We’re launching rockets with iPods attached. Blast off! Venmo, Launchrock, and Hive76 are launching rockets. Catch an iPad Gift Certificate or an iPod on a parachute. Awesome. Find someone in a Venmo T, get them to buy you lunch! Find someone from Venmo wearing one of these blue t-shirts, and get them to send you some money! We recently performed a study of Venmo social payments data from last year that uncovered some interesting trends and insights into how people are using their phones to pay for things with their friends. One of the reports we found most compelling was a categorization of all social payments made on Venmo over the last year. While there were thousands of different ways people used Venmo, a few categories made up the majority of payments. Based on these findings, we’re working on some new features that should make Venmo even easier and more fun to use for these popular activities. Look forward to seeing some new releases very soon, but for now, enjoy perusing the most popular payment categories of 2010. How much did you spend on tacos last year? Given that these payments were made for the most part from mobile devices, we were surprised tix were not more popular than tickets. These household payments (eg, comcast ) are probably the most utilitarian of Venmo payments. Paying for cable somehow is just not as exciting as paying for a party. Some of our personal favorite travel expenses: gas and tolls. You can make these payments from the passenger’s seat and you don’t have to worry about the driver tyring to graciously refuse your contribution. Splitting meals was an incredibly popular social payment among Venmo users, with the most frequent being lunch. Venmo users never have to remember who has the next round, because they settle up using our iPhone and Android apps—and, apparently they are highly caffeinated! We’ve seen a lot of people publishing social payments through the Venmo iPhone and Android apps to tell their friends when they are doing fun things like going to restaurants, playing team sports, or going on ski trips. Sometimes, in addition to publishing the payment to all of your Venmo friends, it’s nice to more directly include some friends. We’ve seen some users CC-ing friends just like they would @mention them on Twitter or tag them in a Facebook post. To make sure none of your friends miss a payment that you tag them in, we’ll notify anyone whose Venmo username is included with an @metion in your payment note. So now you can pay Dave for lunch and thank Ted for a good recommendation with a just one Venmo! Making it really easy and really fun to spend money with your friends is our mission, and after a long week it’s always a pleasure to hear from users like Gina! Ted has been crushing it lately. Lots of updates coming soon. Btw, are you on the beta list for our iPhone app yet? As a tutor or any on-location service provider, it’s especially difficult to accept credit card payments. Since cash may not be the most convenient payment option, let’s take a look at how you can use Venmo to enable mobile payments and promote yourself using SMS. By setting up a Venmo merchant account and a username, you can set up a profile on Venmo Marketplace where you promote your services. Use our social media tools to get the word out about your offerings on Twitter and Facebook, and make sure that you always have clients. When you’re on location after your task is completed, just send Venmo a text message with your client’s phone number, email address, or Venmo username with the amount he owes you, with the syntax “$45 from 5156088009 for math tutoring”. He’ll receive notification of the invoice, and will receive reminders until the payment has been made. Once it has, it’ll be transferred to your Venmo account. Never deal with cash anymore! Sign up for Venmo today and use it as a service provider. Credit card and charge fraud causes cardholders and issuers numerous problems and wastes time and money; the amount of goods and services purchased with fraudulently obtained personal identity was more than $50 billion dollars last year. Read on to learn about how to keep your information secure and avoid credit card fraud. Keep an eye on your credit card every time you use it, and make sure you get it back as quickly as possible. Try not to let your credit card out of your sight whenever possible. Be very careful to whom you give your credit card. Don’t give out your account number over the phone unless you initiate the call and you know the company is reputable. Never give your credit card info out when you receive a phone call. (For example, if you’re told there has been a ‘computer problem’ and the caller needs you to verify information.) Legitimate companies don’t call you to ask for a credit card number over the phone. Never respond to emails that request you provide your credit card info via email — and don’t ever respond to emails that ask you to go to a website to verify personal (and credit card) information. These are called ‘phishing’ scams. Never provide your credit card information on a website that is not a secure site. Shred all credit card applications you receive. Don’t write your PIN number on your credit card — or have it anywhere near your credit card (in the event that your wallet gets stolen). 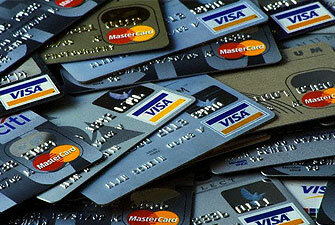 Shield your credit card number so that others around you can’t copy it or capture it on a cell phone or other camera. Keep a list in a secure place with all of your account numbers and expiration dates, as well as the phone number and address of each bank that has issued you a credit card. Keep this list updated each time you get a new credit card. Only carry around credit cards that you absolutely need. Don’t carry around extra credit cards that you rarely use. Open credit card bills promptly and make sure there are no bogus charges. Treat your credit card bill like your checking account — reconcile it monthly. Save your receipts so you can compare them with your monthly bills. If you find any charges that you don’t have a receipt for — or that you don’t recognize — report these charges promptly (and in writing) to the credit card issuer. Always void and destroy incorrect receipts. Shred anything with your credit card number written on it. Never sign a blank credit card receipt. Carefully draw a line through blank portions of the receipt where additional charges could be fraudulently added. Carbon paper is rarely used these days, but if there is a carbon that is used in a credit card transaction, destroy it immediately. Never write your credit card account number in a public place (such as on a postcard or so that it shows through the envelope payment window). Ideally, it’s a good idea to carry your credit cards separately from your wallet — perhaps in a zippered compartment or a small pouch. Never lend a credit card to anyone else. If you move, notify your credit card issuers in advance of your change of address. Always check your receipts against your billing statement. If you think a charge amount was changed, call your credit card company immediately. One of the biggest points of vulnerability of credit card fraud is when you’re making an actual payment transaction and the card is with the merchant. There are numerous stories of employees swiping cards multiple times or writing down card numbers, online vendors selling credit card information, or credit card information being solicited by phone calls. When you use Venmo for payment transactions, you elimination this hassle of vulnerability, since your credit card information is never transmitted to the vendor. Instead, they interact solely with Venmo’s servers, meaning your credit card information is never out in the open for others to intercept or hack into. Venmo helps you guard your credit card number, since you never actually have to give it out to vendors that accept Venmo payments. Let your favorite online vendor know that you want to use Venmo to buy goods online. Protect your credit card information and avoid fraud by signing up for Venmo. And merchants— it is your responsibility to ensure that credit card fraud never happens. Make sure that this is the case by adopting Venmo today! As more and more people are preferring to use their credit cards over cash for a number of reasons (like the high cost of cash), it becomes key to accept card payments as an independent seller. Maximize the effectiveness of your next garage sale by using Venmo to promote goods, manage inventory, and process sales. Using Venmo’s social media tools, you can easily promote your garage sale with just a few clicks. Make different ads for different days, track which one is more popular based on traffic to your page, and decide what day to have your sale on! You no longer have to rely on guesswork and a few signs on the road to get traffic to your front porch. Make the most of your time and use Venmo instead to advertise what you’re doing. If you’re driving around on a weekend morning, aren’t you more likely to stop by at a sale if you can buy goods whether or not you have cash? Make it easier for your customers to pay you by accepting easy credit card payments. When a purchase is made, just send the customer an invoice using Venmo— send Venmo a text with the price of the good sold and the customer’s phone number, email address, or Venmo username. If the customer doesn’t have a Venmo account, he’ll get instructions on how to key in his credit card information and complete the payment. All they have to do is confirm the transaction and the payment will be sent! For example, if you sell a chair for $10, send Venmo a text to (646.863.9557) with “$10 from 408-902-1050 for chair”. In the rush of a big sale, you’re often likely to misplace items or forget exactly how much you sold your products for. Eliminate this hassle by using Venmo to track your items. When you’re sending a customer an invoice, just include “for itemname” to track the item; the transaction and item name will show up on your dashboard. Soon, we’ll offer the ability to import Venmo transactions into online budgeting services like Mint and Wesabe. 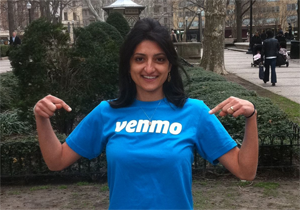 Be a smart seller; don’t waste time and sign up for Venmo today! For many people, cash is the preferred method of transaction when purchasing goods or services. There are numerous reasons: some people feel more comfortable tracking spending by the amount of cash in their wallet, others shop frequently at locations that do not accept cards, and still others believe that cards are a more expensive transaction method because of interest on payments and similar factors. Lately, studies have surfaced that help to dispel this myth of cash being the cheaper option. Here, we’ll explore the hidden costs of using cash. First, some interesting facts about ATMs. The average ATM in the US posts 3,000 transactions per month, and in total ATMs dispense $33 billion in cash every month. In fact, ATMs account for 65% of all banking transactions in the US. But at what cost? There are about 370,000 automated teller machines across the United States, about 1 for every 296 people. This dramatic growth in the number of ATMs can’t be attributed just to banks wanting to help out customers, right? Of course not- ATMs are a very profitable venture for both banks and independent operators! About 98.3% of ATMs levy surcharges on customers, and these fees are rising every year. According to a report from Bankrate.com, the average cost of using an out-of-network ATM is $3.43. On a $40 withdrawal, that’s an 8.6% charge! In fact, the average American pays an estimated $60 to $65 in ATM fees alone per year. In total, Americans paid $4 billion in ATM “convenience” fees in 2008. When you compare the average $3 surcharge to occasional debit/credit card fees of about 50 cents, cards don’t seem so expensive. And then, consider the advanced tracking capable with combining a credit card account with an online budgeting service like Mint or Wesabe- it’s possible to know exactly where your money is going! That’s not even mentioning the various rewards and cashback programs offered by credit card companies these days, allowing you to earn 1-2% of your money back. For some, that’s savings of hundreds of dollars a year. Why use Venmo? It allows you the benefits of cash (you can use it at vendors that don’t accept cards), and combines it with the convenience of cards (tracking spending, cashback, avoiding trips to the ATM). Sign up for Venmo today and eliminate pesky ATM fees once and for all! Back when people used to buy CD’s, it was easy to make sales on the spot during performances and gigs, catering to the fans’ desires to support musicians they enjoy. In the digital age, it’s been tough to capitalize on the same dynamic, as fans opt to buy music at home on the computer, where they have more options and you have less of a direct marketing influence. Change this today by using Venmo SMS Pay to promote your music during performances, and make it easy for fans to support you! Log onto your Venmo Merchant Account and set keywords for the items you want to sell, making sure to check “digital goods” and “randomly generate password key” for the music. At the end of this process, select “generate HTML code” and copy the code. On your website, set up a page where users can download your album, and enter the HTML code to make the page password protected. If users have a Venmo account, the payment will be processed, and users will receive a text with the URL and password to download the music from. If they don’t, they’ll receive another SMS to enter and verify their credit card information, and their payment will be processed.